Disclosure: I was sent this game to facilitate my review. The views expressed in this post are my own. This post contains affiliate links. I like to be “in the know.” If there is something new, I want to know about it. New movie. New book. New restaurant. You name it…if it is new I want to know about it. It is not surprising that my chosen profession is that of blogger, more specifically, review blogging. I fell in to blogging in 2008 and have not looked back! My kids like to be “in the know” as well. My oldest was one of the first of her friends to ask for an American Girl doll for Christmas. My middle was a very early adopter of Silly Bandz. When my youngest first heard about Skylanders in 2011, he was a man…kid…on a mission to get his hands on Skylanders Spyro’s Universe, the first Skylanders game. He had to have Skylanders Spyro’s Universe. Fortunately, I know some awesome PR people who are always willing to hook a blogger…or her kid…up with the latest and greatest toys and games. A few weeks ago, my son was beyond thrilled to find that we were one of the Skylanders Trap Team blog reviewers. I handed Skylanders Trap Force to him and he wasted no time playing. We received the Skylanders Trap Team Starter Pack for Wii, but the great thing about Skylanders games is that all the Skylanders figures work on ALL game systems. So if you have Skylanders Trap Team for PS4, your child can play with his Skylanders figures on any game system. 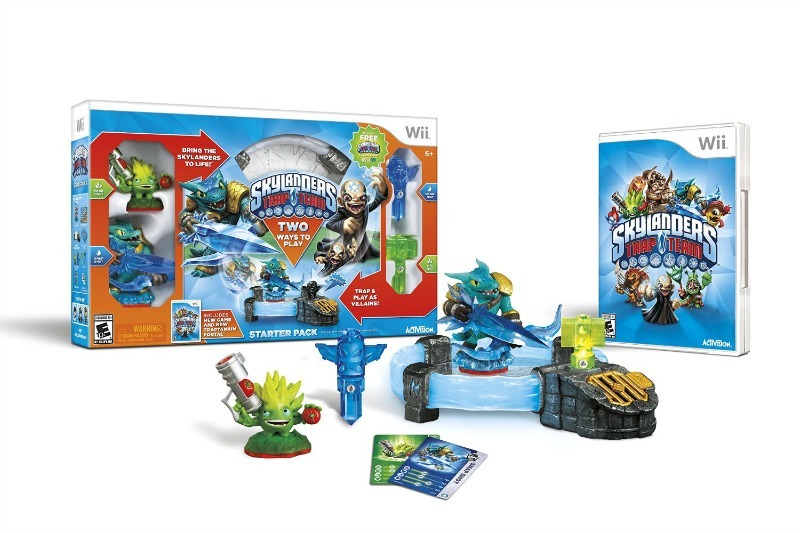 What Game Systems Does Skylanders Trap Team Work on? All of Them! What Is in the Skylanders Trap Team Starter Pack? Skylanders Trap Team retails for $64.99 (Nintendo 3DS), $74.99 (PS4, XBox One, Wii, and Tablet), $82.49 (XBox 360), $84.33 (WiiU), and $85.55 (PS3). What Is Skylanders Trap Team About? I’m not a gamer but here’s the gist of what Skylanders Trap Team is all about. Many notorious villains are on the run after Kaos blew up the walls of the Cloudcracker Prison. The Skylanders need your help to capture all of them using the Traptanium, a magic material that can harness the power of the Elements. You can collect over 60 Skylanders and more than 40 villains. The bonus is that all the Skylanders Swap Force figures work on Skylanders Trap Team! What Did My Kids Like About the Other Skylanders Games?